Standing formidably in a lush garden of its own, this palatial bungalow beautifully combines the old-world charm of the colonial era and modern comforts of today. The façade features dainty fretwork motifs prettifying the traditional sloping clay-roof. Inside, it holds three spacious bedrooms, a living area, and a stately dining hall. The bedrooms are each well-furnished with vintage furniture elements such as a cabriole-legged bookcase-desk and an open coal-fired fireplace, while a solid-wood bed and cushioned chairs compose the rest. Each is equipped with a modern bathroom, equipped with all the basic amenities like running hot water. Floral drapes and calm-toned décor enhance the homely aspect of the setting. 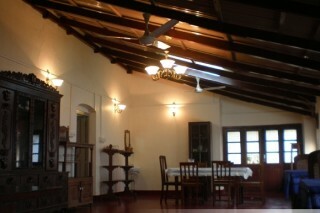 The stately dining hall features exposed-wood beam interiors and is furnished with a six-seat table and couple dinettes, an antique crockery shelf featuring intricate fretwork motifs, an old-fashioned shelf, and torch-style light-fixtures. 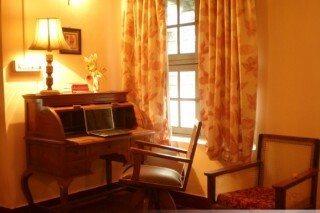 Perfect for nostalgic souls and families on a theme vacation, our bungalow is a charming stay for everybody. 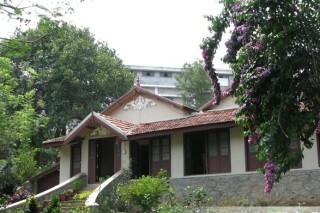 Bungalow is located at the heart of yercaud town. Within less than a kilometer from Yercaud 'Big Lake' this Bungalow provides the ideal setting to explore this beautiful destination.For your comfort and privacy we recommend that you book the entire Bungalow. ' 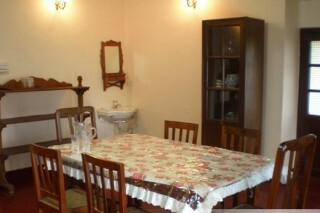 Bungalow' can now accommodate a maximum of 15 guests comfortably in the entire bungalow. Explore the many sights and sounds of Yercaud. plan your trip in advance and we can arrange for you and your family/friends to visit a nearby coffee plantation. you can also settle down besides a cozy bon-fire by night to enjoy a meal under a Star Studded Sky! Nearby famous tourist attractions include Yercaud Lake and Killiyur Falls The Killiyur Falls is a beautiful cascading waterfall which has water from Yercaud Lake and Shevaroy Hills falling into the Killiyur valley. Tourists will also enjoy trekking along this waterfall to reach its bottom. 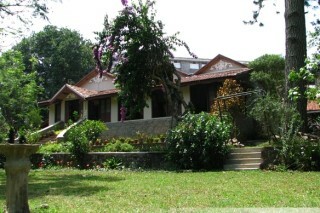 Other significant sight-seeing spots in Yercaud are Karadiyur View Point, Botanical Garden and Servarayan Temple.